I am completely satisfied with the items I recently received fron Koehler home Decor. You have a beautiful selection of merchandise, which makes it hard to decide what to buy. I certainly will be coming back in the near future. I love Koehler Home Decor. I own my own business and am very happy with the quality and prices of the merchandise I order from them. I feel I am giving my customers a great product. Keep it up Koehler, You're Great!!! We Have a small retail shop and being able to purchase 1 or 2 items of like kind rather than a minimum of 24 or better fits our budget and gives us a chance to try new products out for re-sale. This is a great company and their shipping prices have allowed us to pass the savings on to the customers. The pricing of these products are excellent. Fast service and fast shipping is equally impressive. I will be doing business with Koehler for a very long time! I have never been disappointed with the products I have bought. Searching was easy and most times they had what I was looking for. My products would usually arrive 7-10 later. I absolutely LOVE Koehler Home Decor! They are the best dropshipper around. 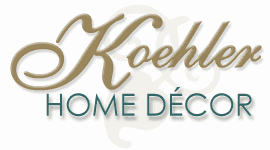 I have many satisfied customers, and I will be a long time customer of Koehler Home Decor! Keep up the GREAT work! I shop from Koehler ALL the time for my wedding & design business. I have never had a problem. However, on this last shipment I received 2 damaged items. Customer service was very prompt in responding to my e-mail and let me know that I did not have to go through the hassle of sending the items back. They refunded my money on 1 item (out of stock) and sent me a new shipment on the other item. I will continue shopping from this merchant and enjoy their service! I started my own business a little over a year ago. I buy alot of my items from Koehler and I am very happy with the quality of merchandise, customer service and the fast delivery. I am very happy with Koehler and plan to be a customer for many years. The products I ordered were just as I hoped. They were great. I loved the items that I bought from this company. The quality is excellent. There was a problem with delivery but these people were great in resolving it. Truly nice folks!! This is a great company to do business with. So far I am very pleased with the quality and service. The pricing is fair. I would recommend Koehler Home Decor to everyone. Thank you for your prompt attention to my orders and your fine selection of products. Great products, great price, will buy again. Thank you so much! I was so happy with the quality of these products and especially how nicely they were packaged. I’ve purchased items from other companies and they are just all tossed in a box without any packing. Thank you so much...I will surely order again from you. The merchant was quick to provide a new cabinet kit when the first one we received was found to have a faulty part. They were easy to deal with and made the process as painless as possible. Customer service is always helpful when I call with a problem and assisting me in my website business. I was very pleased with my first time buying purchase from Koehler Home Decor. The merchandise was of good quality, service was great and I received the order fast. Have already sold many items. By Koehler keeping my cost down, I was able to sell at an affordable price to the customer. That makes my turnover fast. Thank you! Koehler is an awesome drop shipper. Great communication. Very pleased with them and we are a repeat customer!!! Koehler is great to work with, friendly, fast awesome customer service. Always stays in touch with us!!!! Best dropshipper around!!! This store is one of my favorites. Ive shopped at several wholesalers, and none have satisfied me with an overall rating as this one has. Many are very slow on sending out orders, but with this store, I receive order so quick. I just love it! Thats why I keep returning. I have found an excellent supplier with the best prices. Koehler Home Decor is great! Great products with prices to match. B2B it they are a notch above the rest. I was really impressed with the selection, and with how fast my package arrived! Overall, I have to say, this was by far the most delightful shopping experience I have had in a really long time. I will definitely shop with you folks again! Always helpful and responsive especially when I was the one making mistakes. Goes the extra mile in Customer Service. I have enjoyed the shopping experience and the prices are super and your web site is easy to navigate. Telling my friend about your web store. It was a great experience for me.......got great merchandise at a great price. I will be shopping there very often......quality at a good price. Very pleased with the merchandise ordered. Quick delivery, very well packed. Have already placed another order. I am very happy with Koehler Home Decor. They have a very fast turnaround time on orders. I had a problem with some items missing out of one box so I e-mailed them. They sent the things out that day and I received them about 4 days later, no questions asked. The only thing that I would like to see made better is a my account section on their website. It would be nice to be able to check the status of my orders through their site. Overall I think that Koehler Home Decor is the best wholesaler that I have for my business. Excellent service and product quality. Highly recommended! Last night I received my order, three pieces altogether, and was so excited to finally open the package. This is not a complaint, matter of fact it is a major compliment. These items were things I had looked at on other retail sites and was not willing to pay their exceptionally high prices for the items. I was so pleasantly surprised by your cost and quality of product. Not only are the items sturdy and beautiful but they are the perfect addition to my home decor. Thank you so much and trust me when I say I have referred your company to all of my friends and family! Really a pleasure buying from this seller. First class in every way. I highly recommend you choose to buy from this honest seller. I am very HAPPY with this company. Would do business anytime with them. Delightful shopping experiences. Low prices on good quality items. Reasonable shipping rates. Fast shipment on purchases, and items are well packaged for delivery. Web site is well thought out, and easy and fun to use. Will continue to buy from this merchant again and again. This is a great company to work with, very reliable, professional and friendly. As advertised, quick, easy to do business with, very fast shipping. Good prices, fast shipping. Would purchase from this merchant again. I am well pleased with the merchandise I have purchased from Koehler and will do business with again in the future. The products are what they are advertised to be and the prices are great. The shipping could be adjusted to arrive sooner but the shipping costs are also very reasonable.